The personalities, actions, and interactions of two men crucial to the end of apartheid in South Africa are recounted in John Carlin and Oriol Malet’s excellent graphic novel Mandela and the General. Carlin had a perfect vantage point for the events depicted in the book, having served as a foreign correspondent to Johannesburg from 1989 to 1995. His encounters with Mandela and a post-apartheid conversation with General Constand Viljoen (the General of the book’s title), combined with a background in journalism, result in a well-told, perceptive view of both sides in the conflict. Most people will recognize the name of Nelson Mandela, and examples of his patience and sagacity are demonstrated repeatedly in this book, bringing the legend to life. Truly illuminating, however, is the lesser-known role and perspective of Viljoen, a respected military leader among the dominant but minority whites. Recruited to lead the white effort to maintain apartheid, Viljoen gradually realized the futility of the discriminatory policy, and began working with Mandela—to the disgust of many of Viljoen’s white compatriots. Using actual newspaper headlines to stylishly deliver information, Carlin and Malet tell the sometimes complicated tale of the ruling class’s plans to maintain control, and Mandela’s efforts to overthrow them peacefully. With a limited but carefully chosen color palette, Malet evokes moods as well as he depicts actions. Likenesses of Mandela and Viljoen, in particular, are realistic but never stiff or overly photographic. 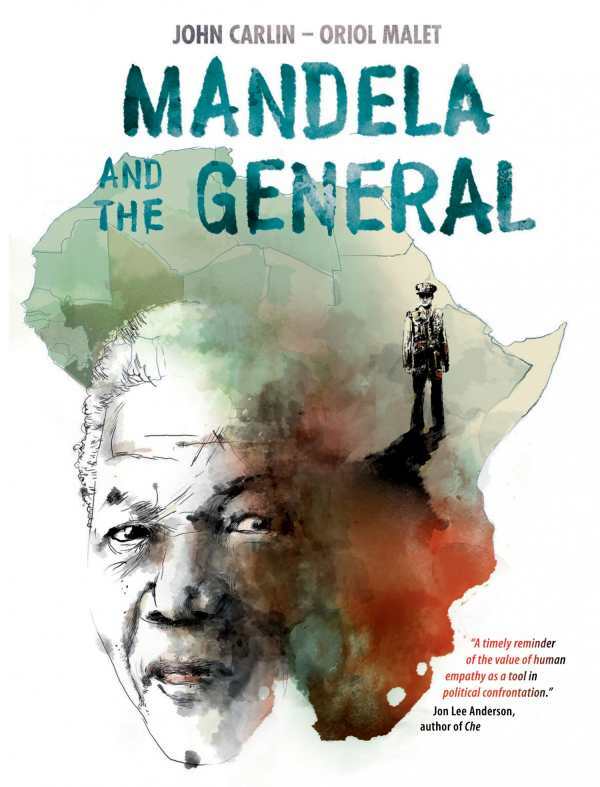 Mandela and the General is an inspirational account of historical events, including Viljoen’s break with his own colleagues in pursuit of the greater good.